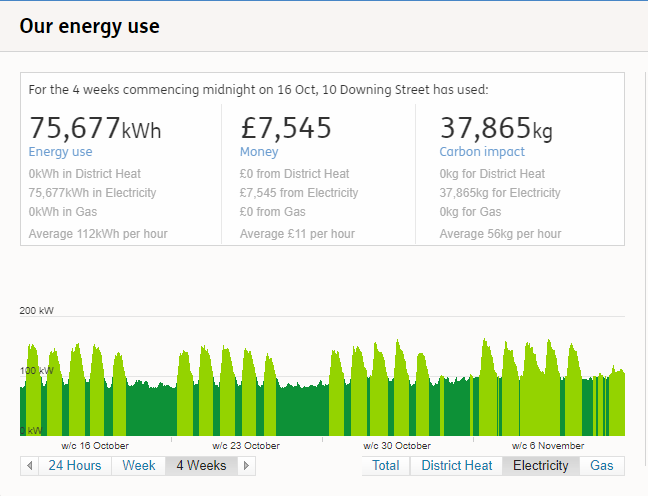 For the week 3 makeover, Eva picked his viz about energy usage at 10 Downing Street. For those of you that might not be familiar with the building, it's the headquarters of the U.K. government and home of the Prime Minister. Basically, it's the equivalent of the White House. I go by it quite often on my commute to work. You might not even notice it if not for the throngs of tourists and the guards with really big guns. Really nice BANs that also have context included. I give people feedback quite often that BANs can be great, but they're meaningless without context. The chart shows the peaks and troughs well. Hold off on working on my viz until we have our weekly Makeover Monday time at the Data School. I've written this section and the two above Sunday night. Explore the data with line charts to get a sense for the patterns in the data. Keep something similar to the BANs; consider different or additional context. Should the timeline show all of the data? Play about with different filter options. 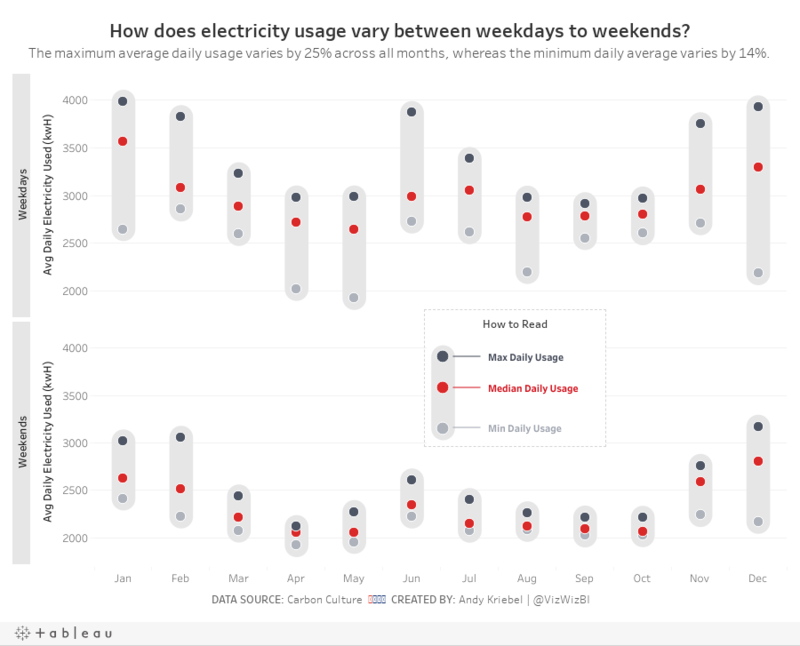 Consider a heatmap that shows usage by hour of the day compared to day of the week or perhaps month. Will reporting energy use, money, and carbon impact in the same dashboard be too crowded? Explore relationships between the metrics with scatterplots. Is a connected scatterplot an option? Would a mobile version be better so that people can look at it on the go? Is there any additional data? The data set only included 2017, so I downloaded back to 2008 as well. But data only existed back to 2013, so I had to deleted 2008-2012. Tableau Prep doesn't allow you to skip the first three rows, which is required for 2013-2016, so I used Alteryx instead and then unioned those years with 2017. Only data for electricity usage is consistent across the years; I was expecting to see money and carbon impact as well. I wonder why don't they include those as well. Anyway, this eliminates a scatter plot. Data was missing for December 2015, so I excluded that month from the data set. There were lots of zeros, so I removed those as well. And here's my viz after working on it for 60 minutes at the Data School.